The Hello Hall of Fame Awards 2019 ceremony took place in Mumbai on Sunday (March 17) with Sonam Kapoor in attendance. 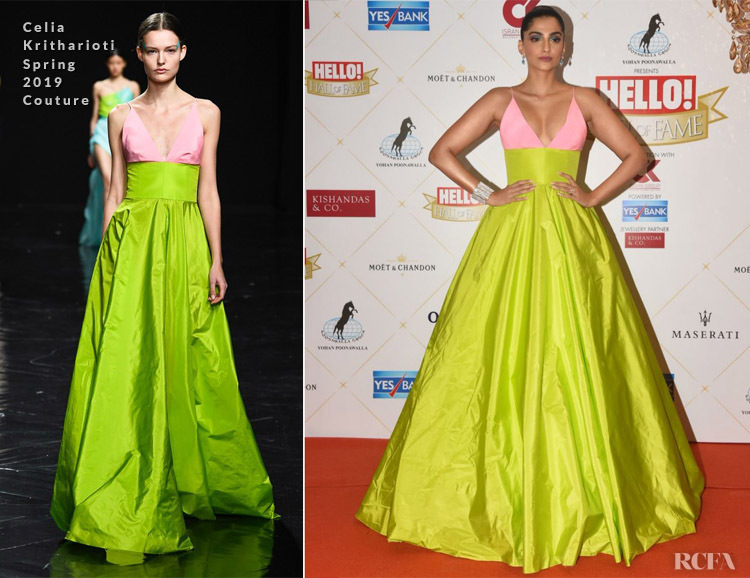 She stood out wearing a colourful Celia Kritharioti Spring 2019 Couture pink and lime-green gown which not only sets the mood for spring, but also gets me excited about what she might bring at Cannes. You may prefer the intense green of the runway skirt, but I believe Sonam’s lighter version is more down to the lighting than anything else. Give me this over a beige gown with embellishments and feathers any day. Sonam completed the look with a neat bun and statement jewels. If you’re having a mild case of dej vu, that could be because Laura Marano wore a similar dress from the same collection to the Oscars.